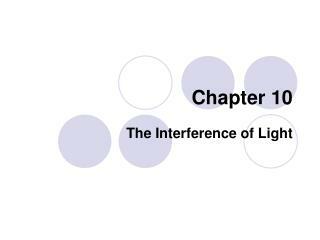 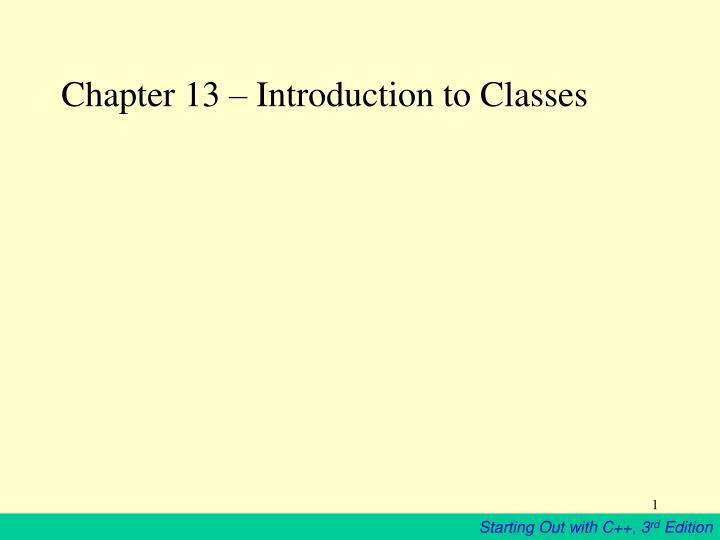 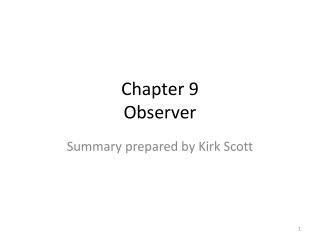 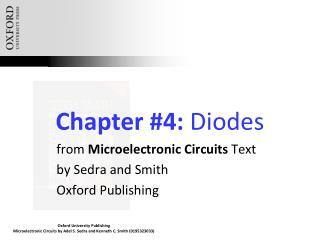 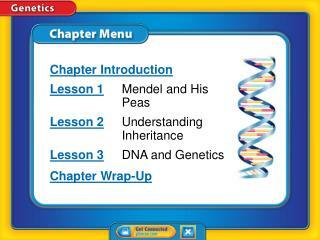 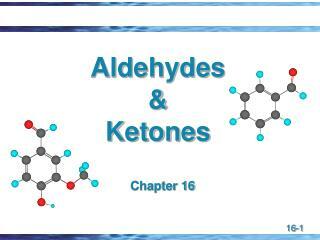 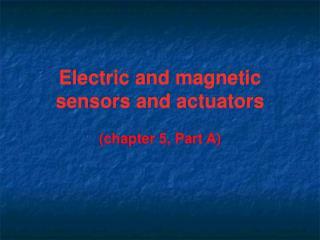 Chapter 13 – Introduction to Classes. 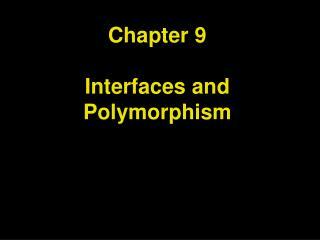 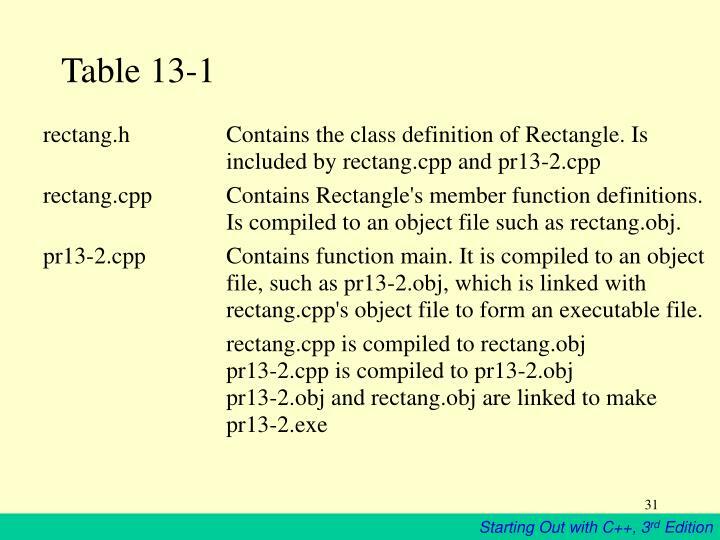 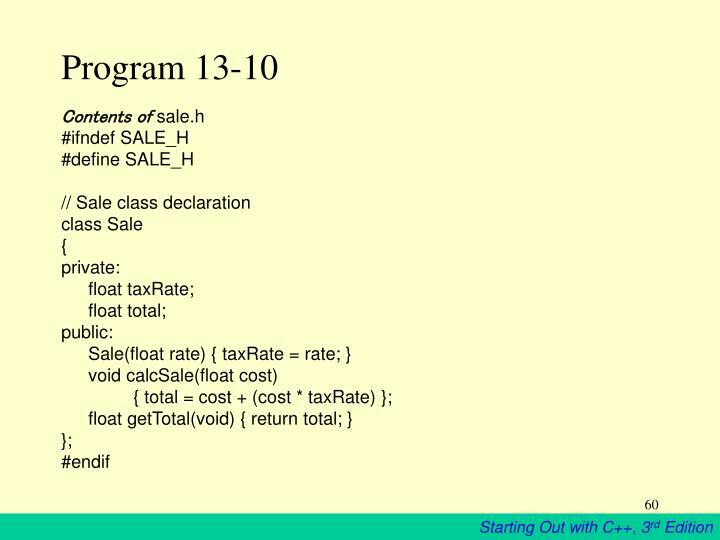 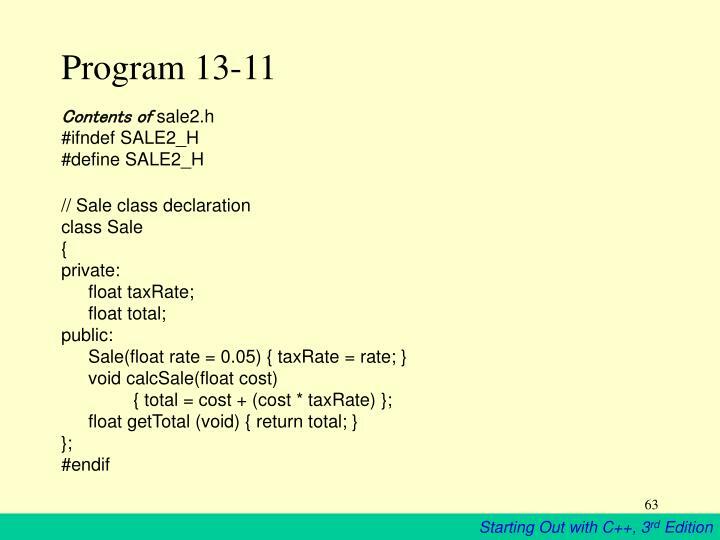 13.1 Procedural and Object-Oriented Programming. 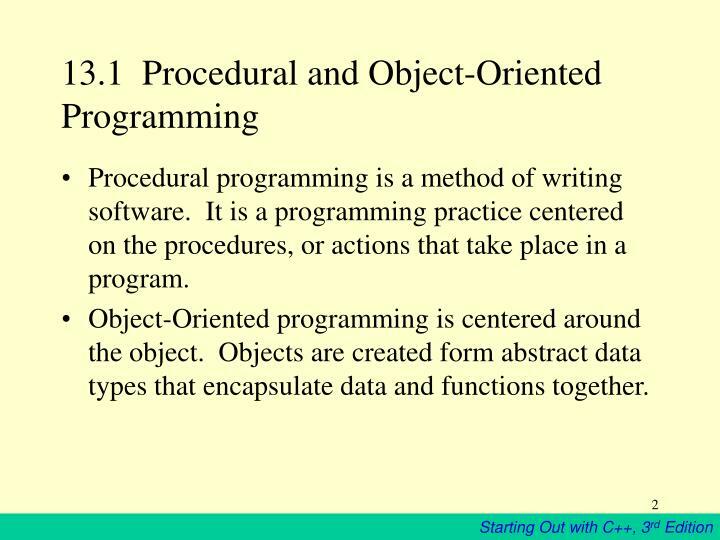 Procedural programming is a method of writing software. 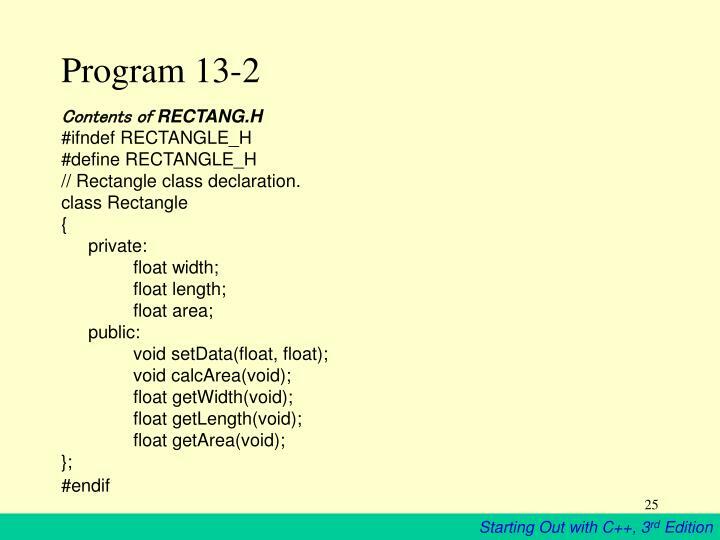 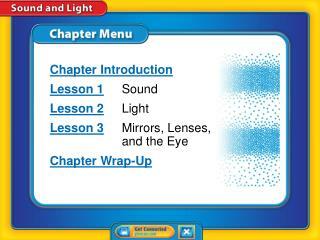 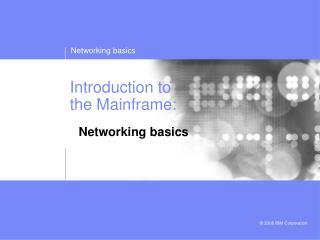 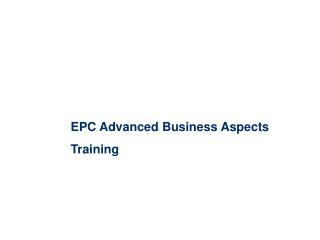 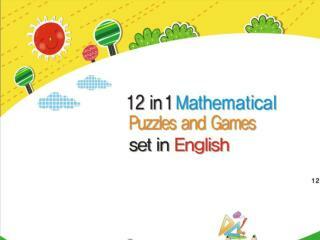 It is a programming practice centered on the procedures, or actions that take place in a program. 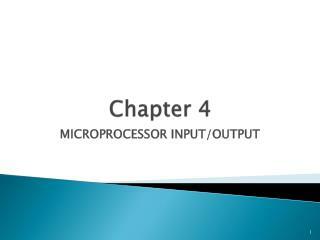 Procedural programming is a method of writing software. 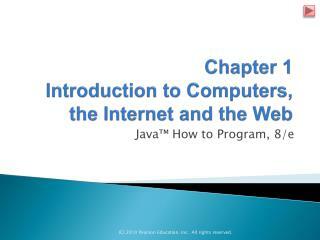 It is a programming practice centered on the procedures, or actions that take place in a program. 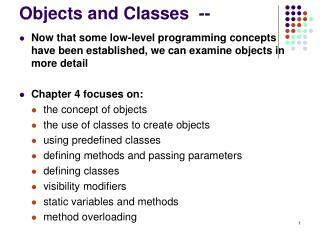 Object-Oriented programming is centered around the object. 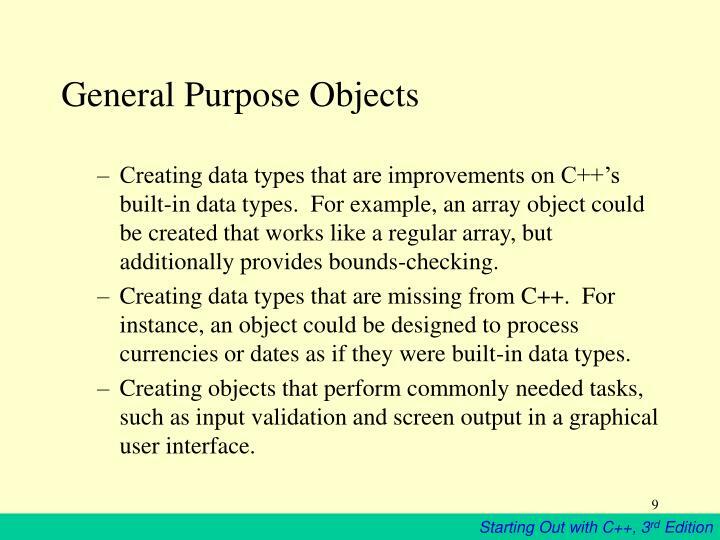 Objects are created form abstract data types that encapsulate data and functions together. 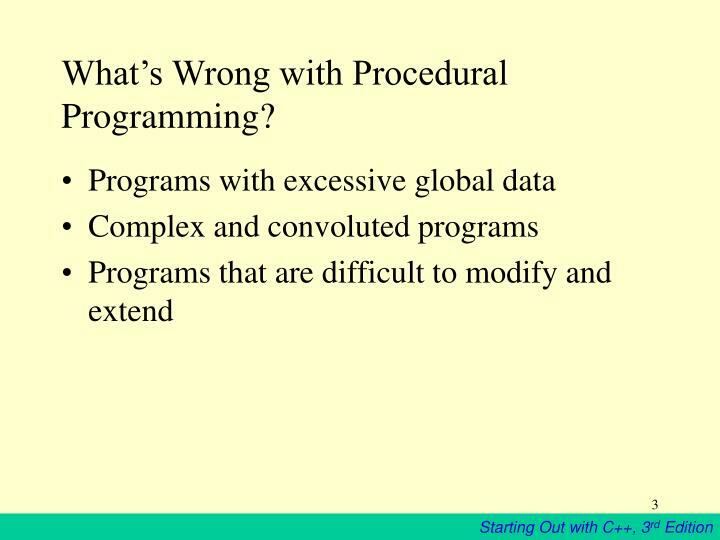 What’s Wrong with Procedural Programming? 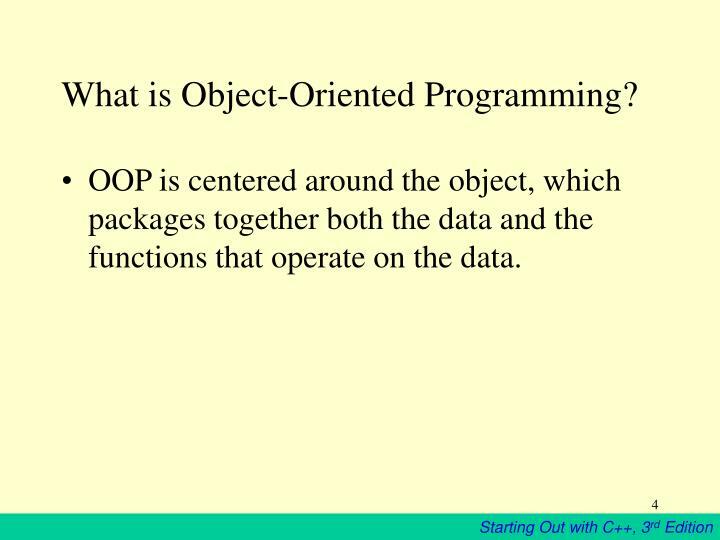 OOP is centered around the object, which packages together both the data and the functions that operate on the data. 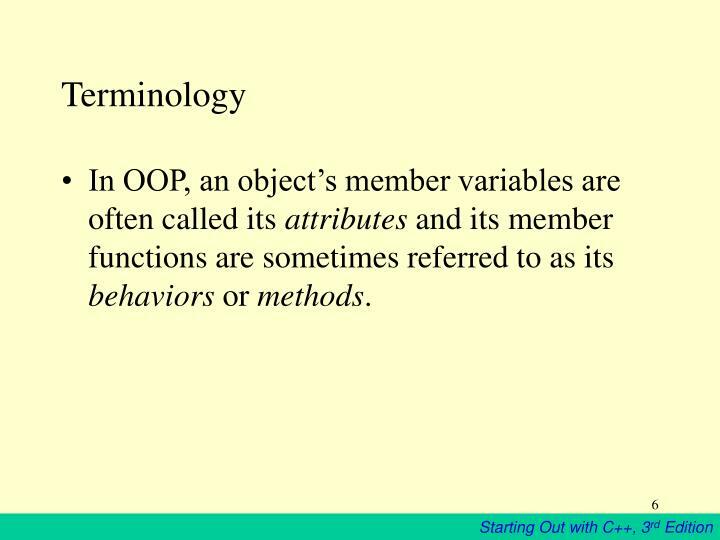 In OOP, an object’s member variables are often called its attributes and its member functions are sometimes referred to as its behaviors or methods. 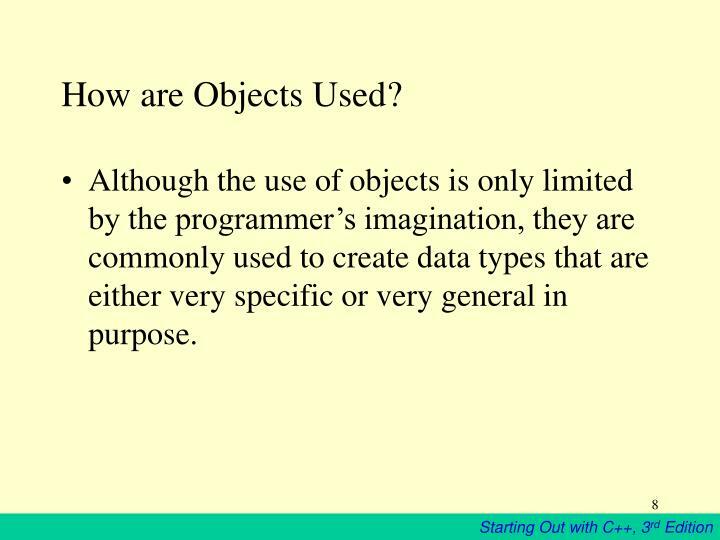 Although the use of objects is only limited by the programmer’s imagination, they are commonly used to create data types that are either very specific or very general in purpose. 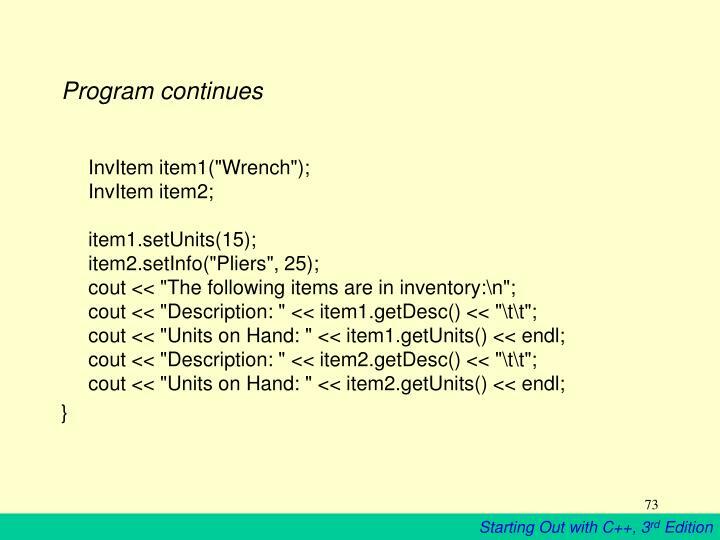 Creating data types that are improvements on C++’s built-in data types. 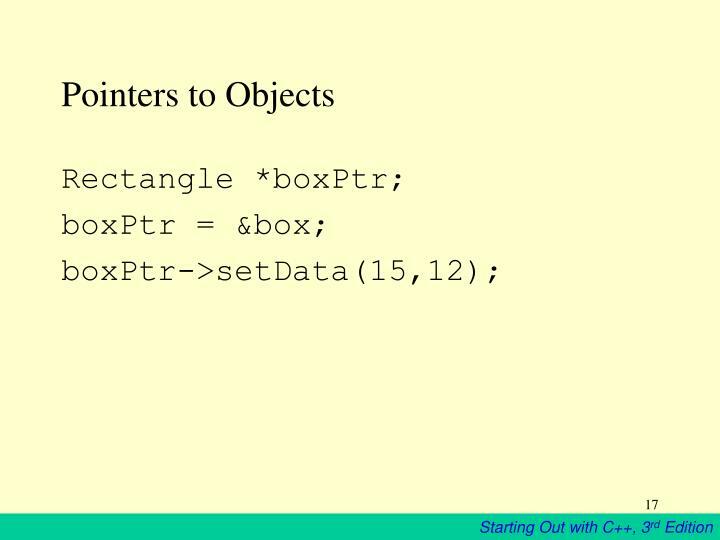 For example, an array object could be created that works like a regular array, but additionally provides bounds-checking. 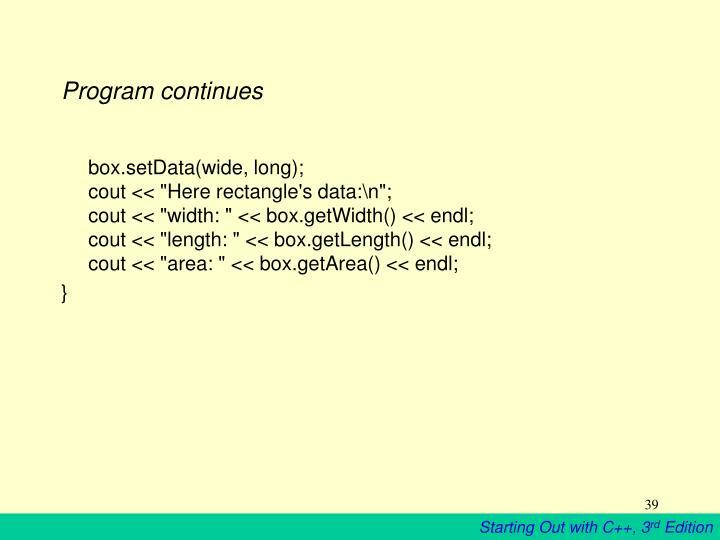 Creating data types that are missing from C++. 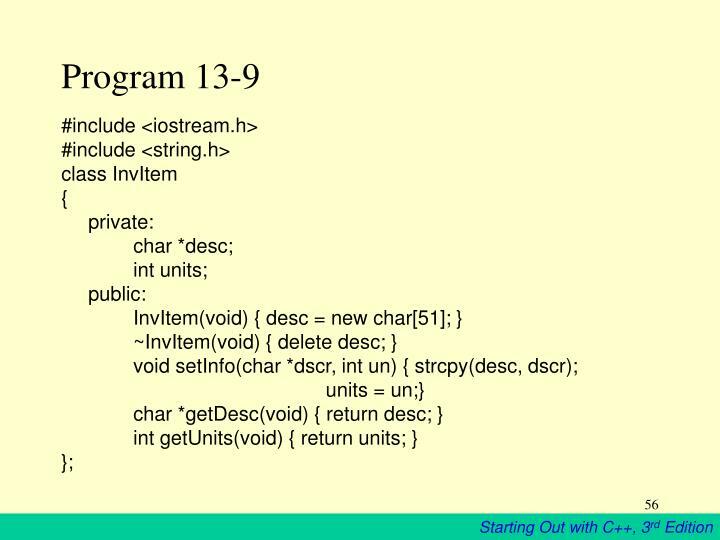 For instance, an object could be designed to process currencies or dates as if they were built-in data types. 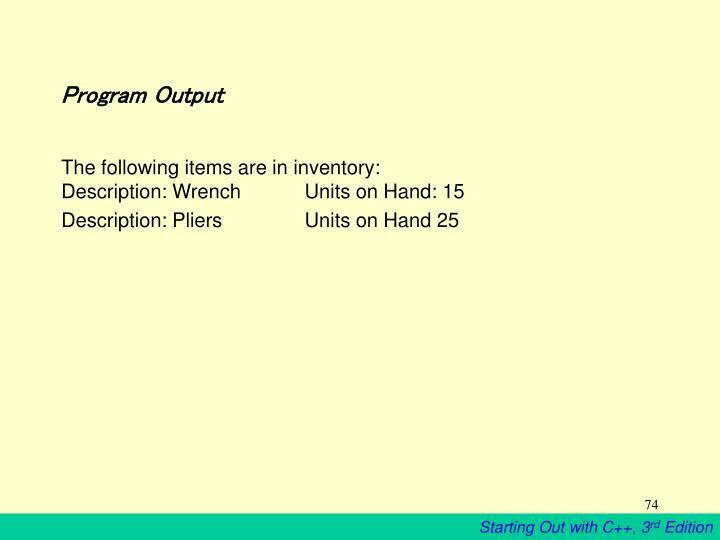 Creating objects that perform commonly needed tasks, such as input validation and screen output in a graphical user interface. 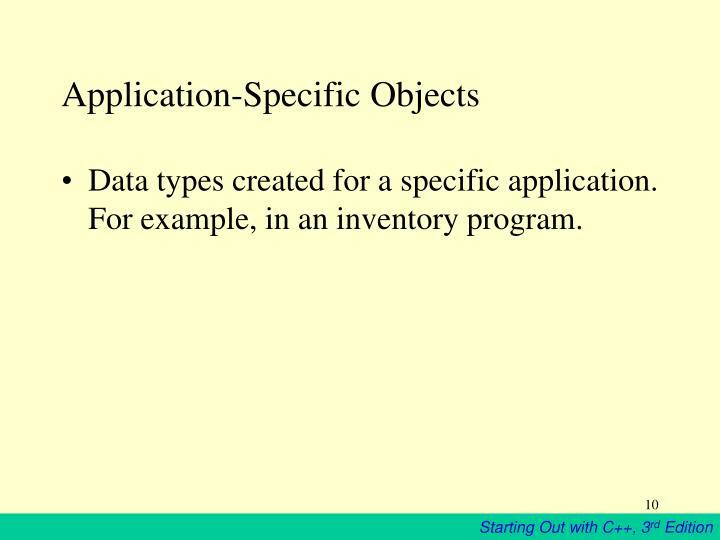 Data types created for a specific application. 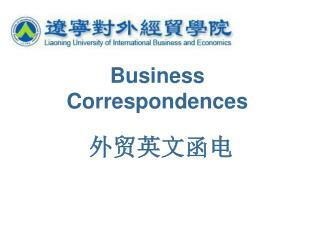 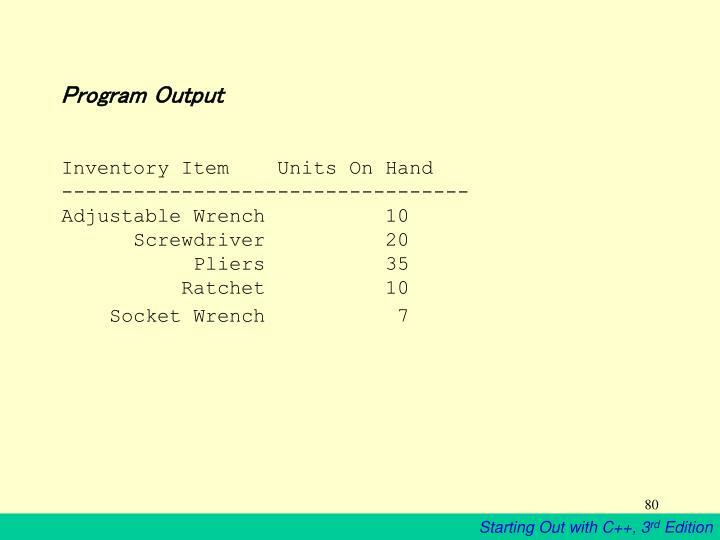 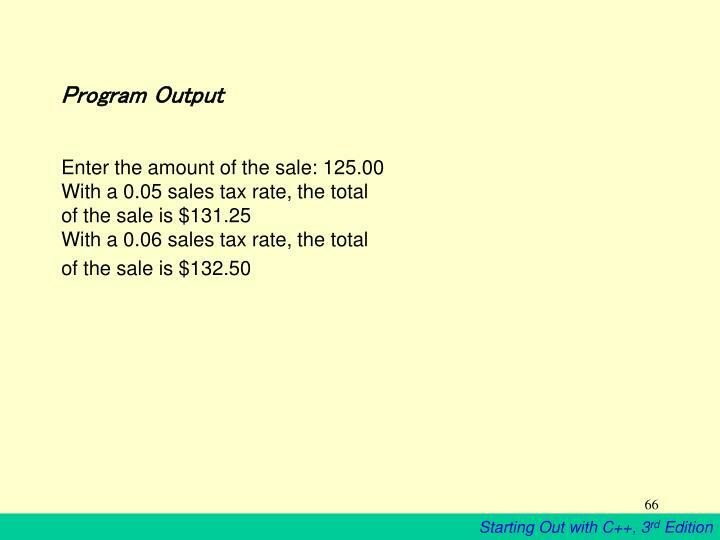 For example, in an inventory program. 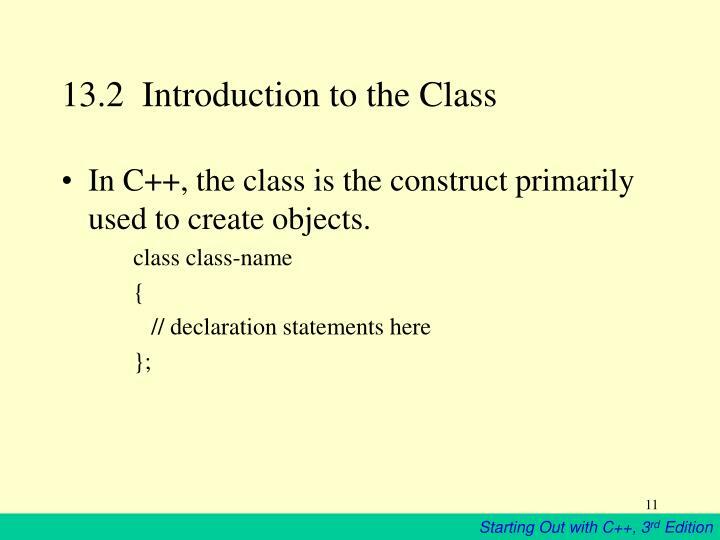 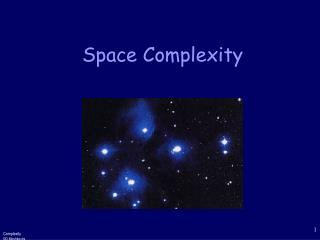 In C++, the class is the construct primarily used to create objects. 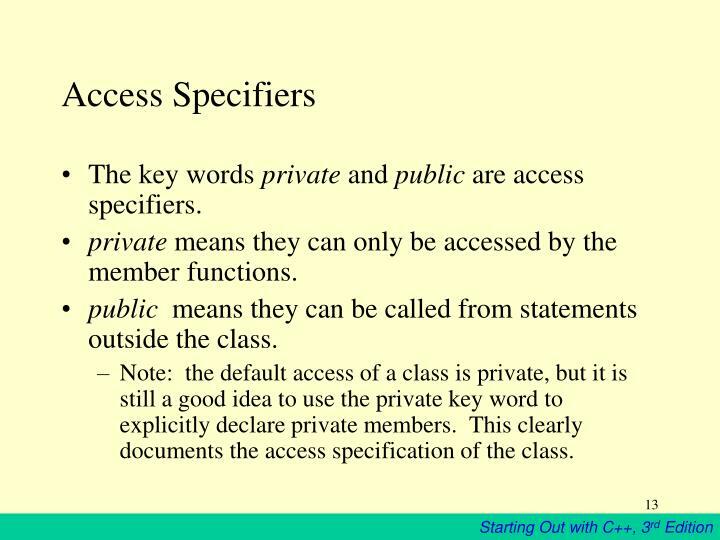 The key words private and public are access specifiers. 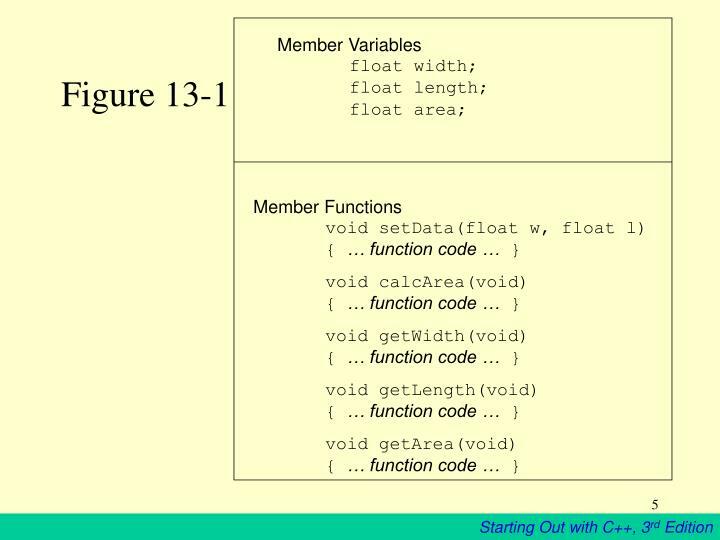 private means they can only be accessed by the member functions. 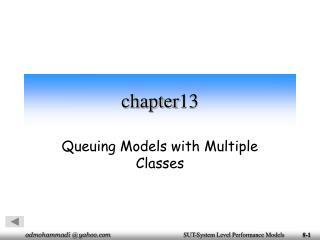 public means they can be called from statements outside the class. 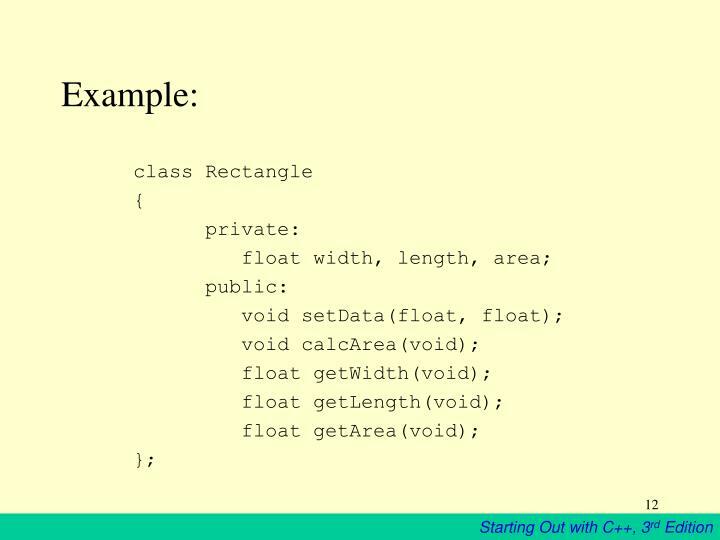 Note: the default access of a class is private, but it is still a good idea to use the private key word to explicitly declare private members. 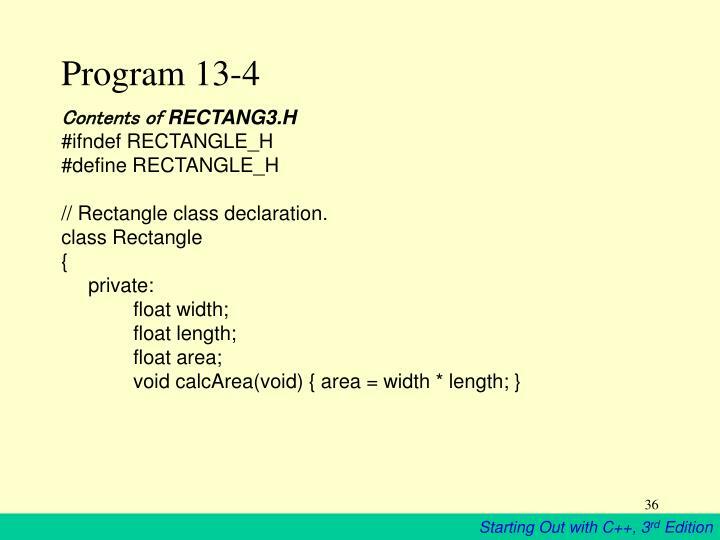 This clearly documents the access specification of the class. 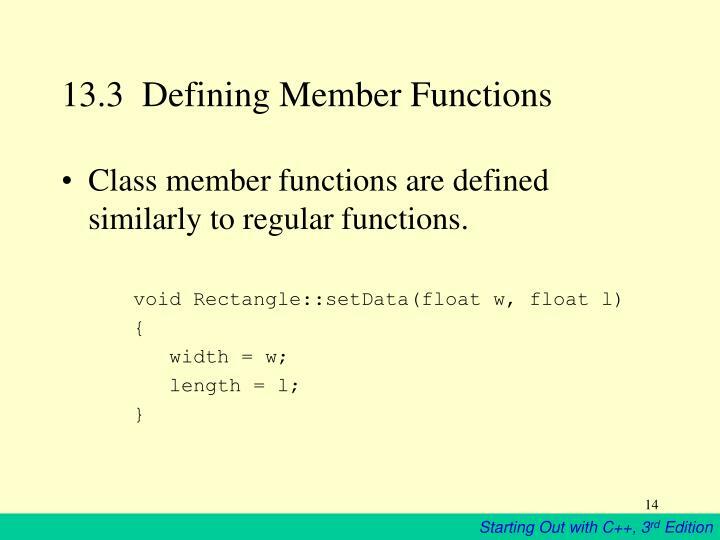 Class member functions are defined similarly to regular functions. 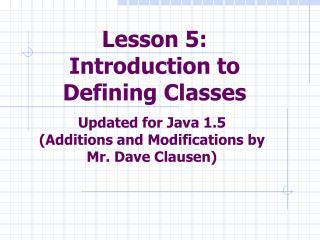 Class objects must be defined after the class is declared. 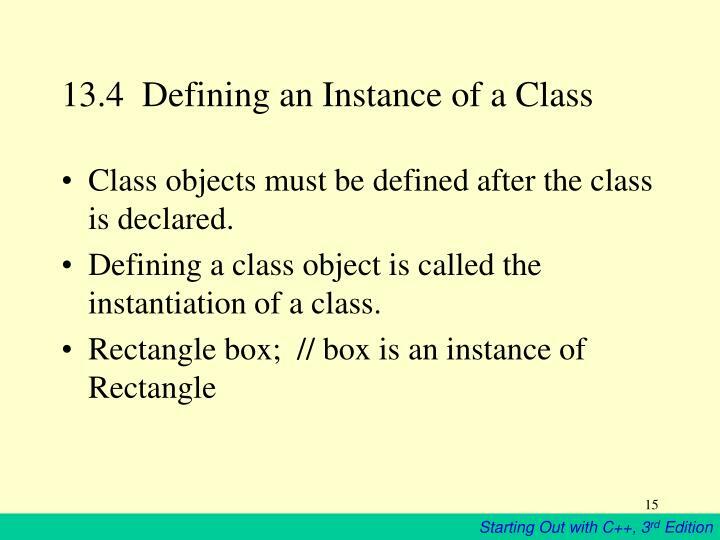 Defining a class object is called the instantiation of a class. 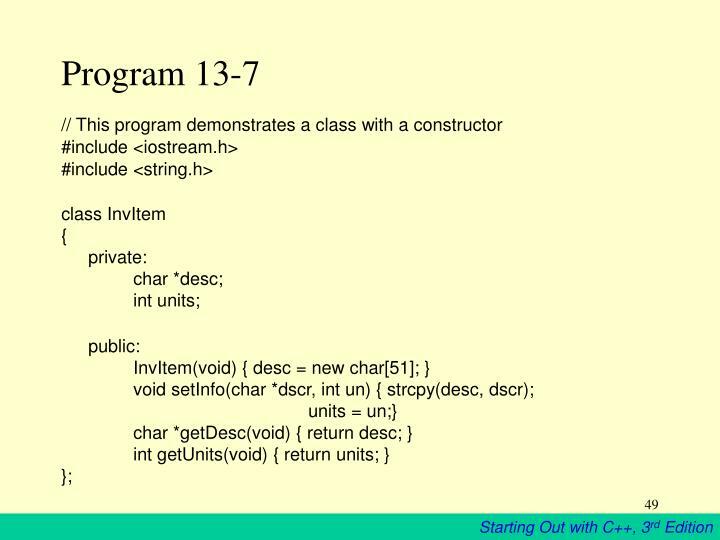 // This program demonstrates a simple class. 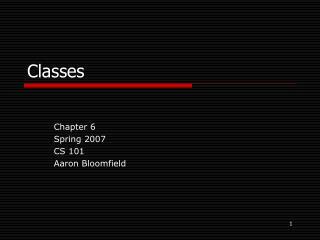 // l to private member length. 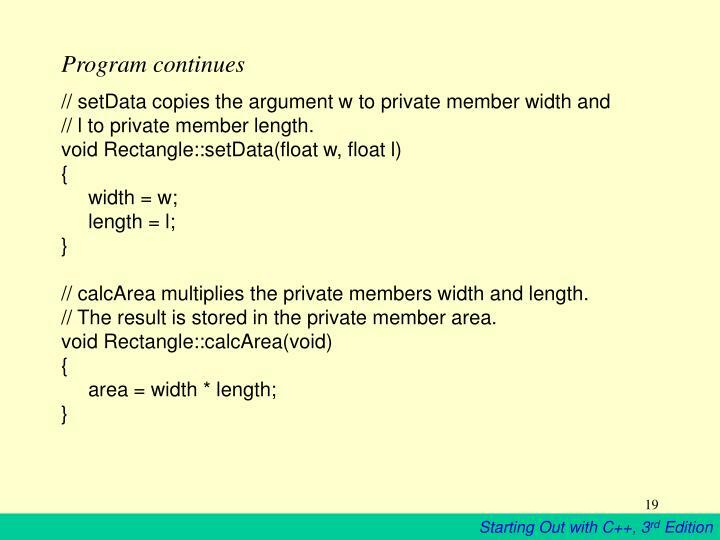 // calcArea multiplies the private members width and length. 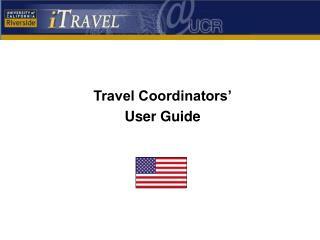 // The result is stored in the private member area. 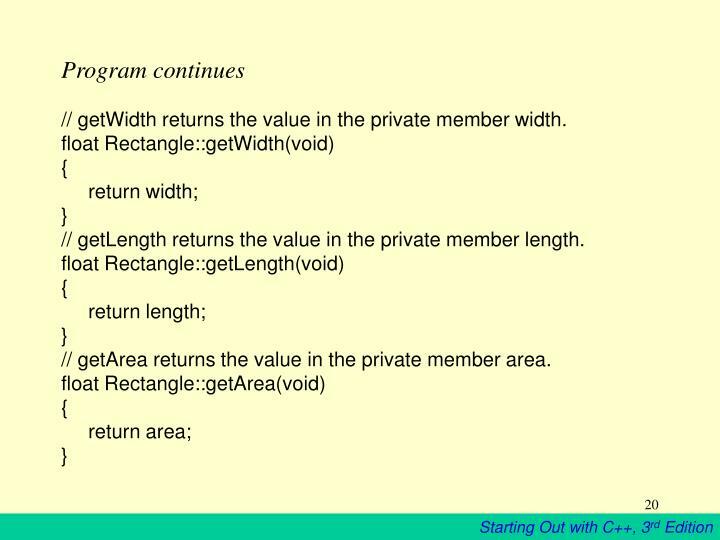 // getWidth returns the value in the private member width. 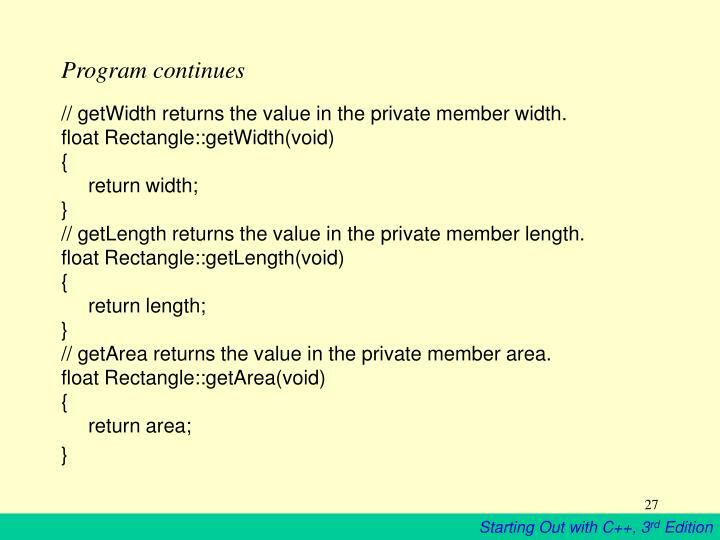 // getLength returns the value in the private member length. 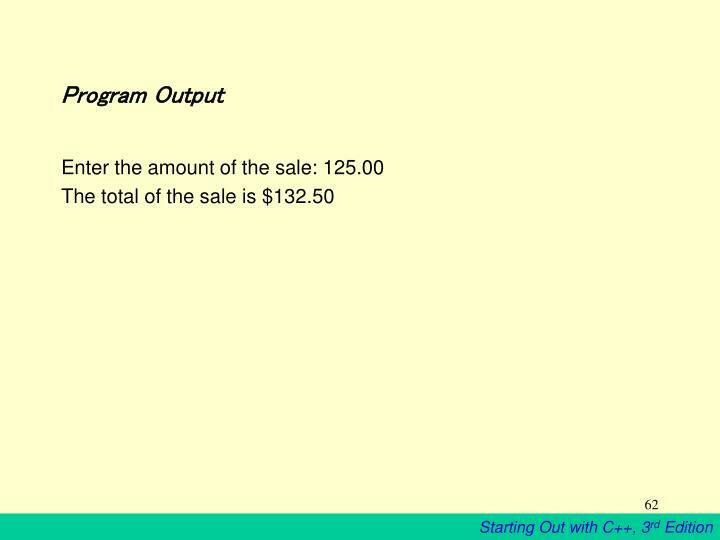 // getArea returns the value in the private member area. 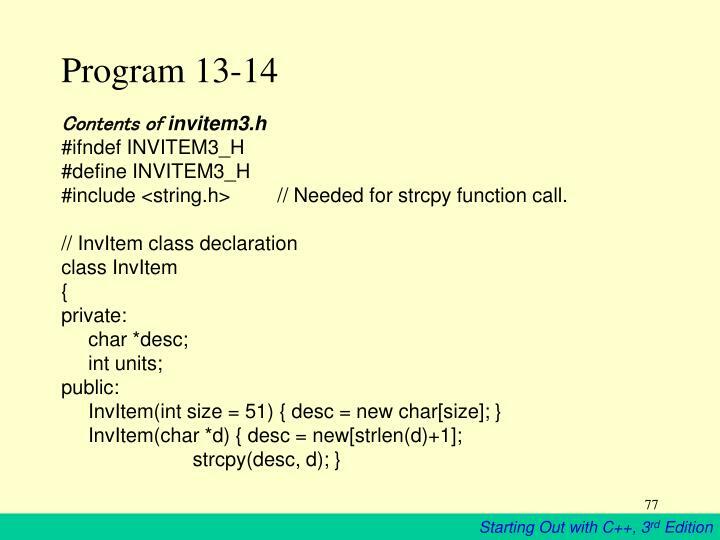 13.5 Why Have Private Members? 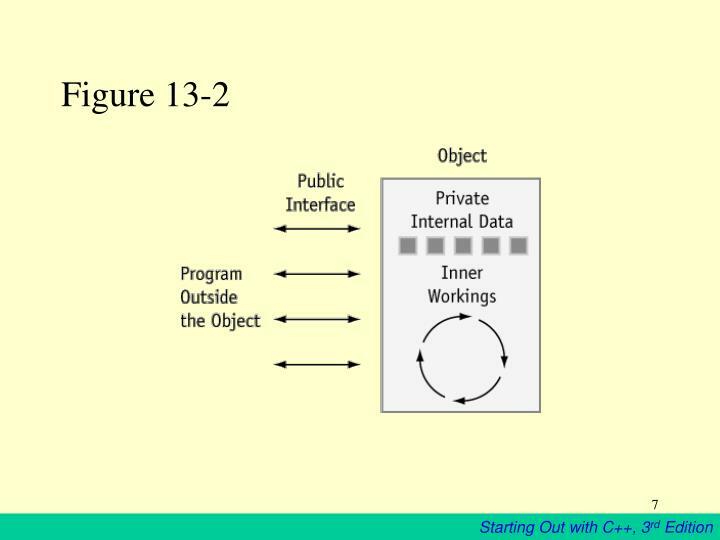 In object-oriented programming, an object should protect its important data by making it private and providing a public interface to access that data. 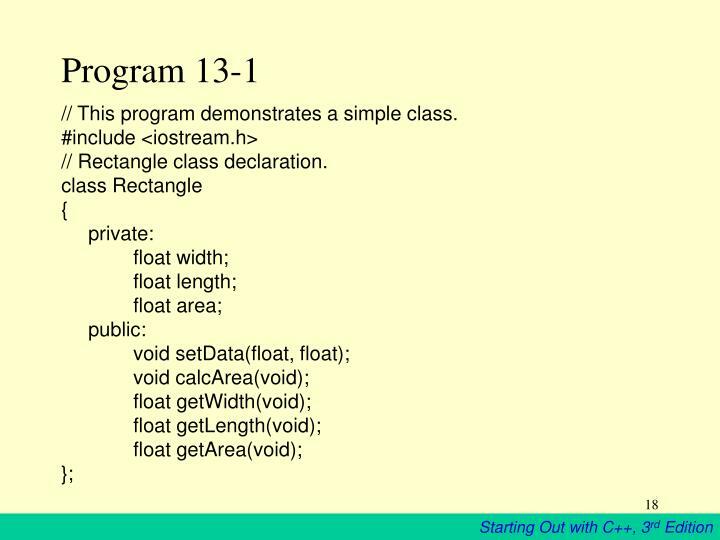 Usually class declarations are stored in their own header files. 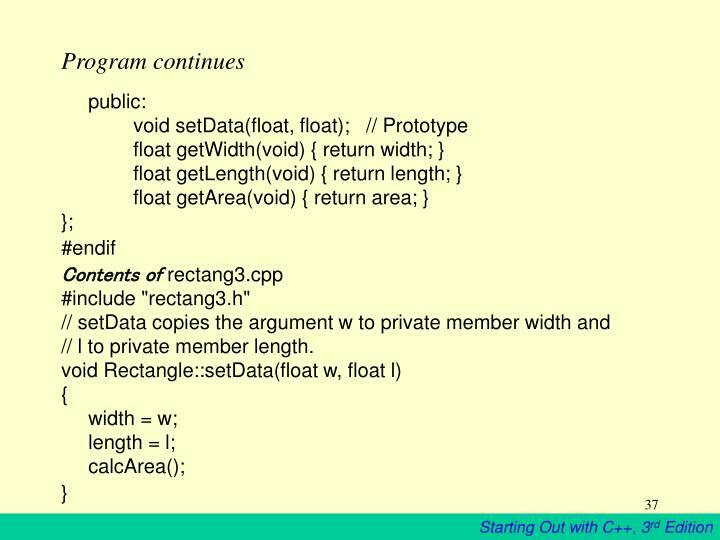 Member function definitions are stored in their own .CPP files. 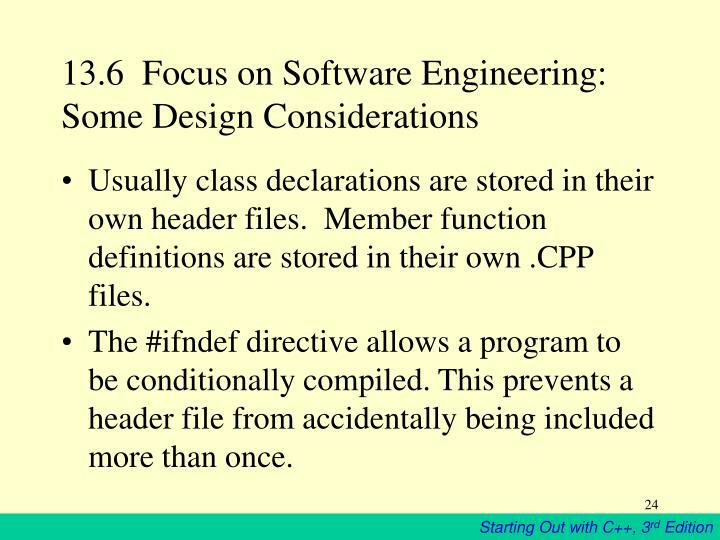 The #ifndef directive allows a program to be conditionally compiled. 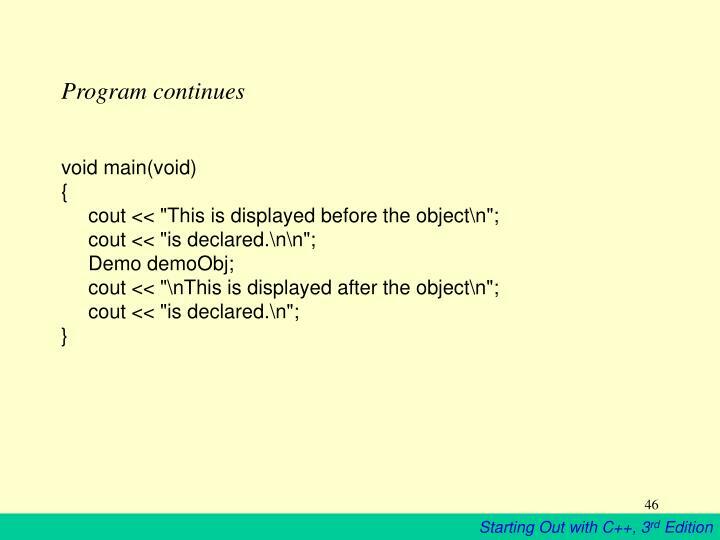 This prevents a header file from accidentally being included more than once. 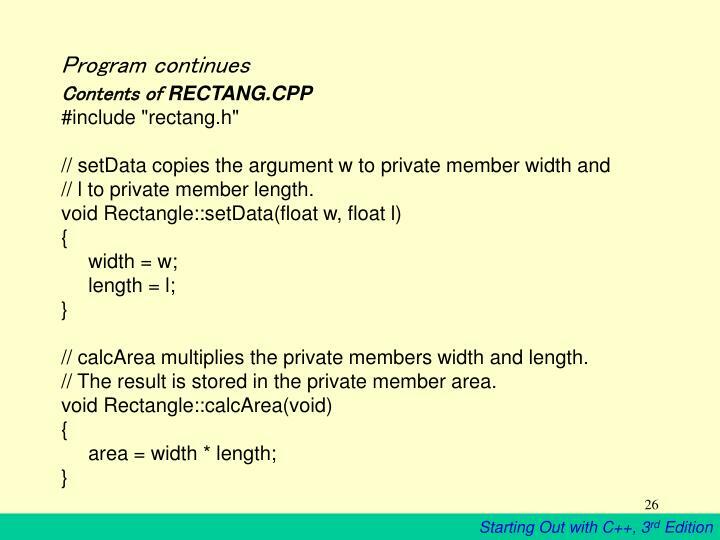 // Don't forget to link this program with rectang.cpp! 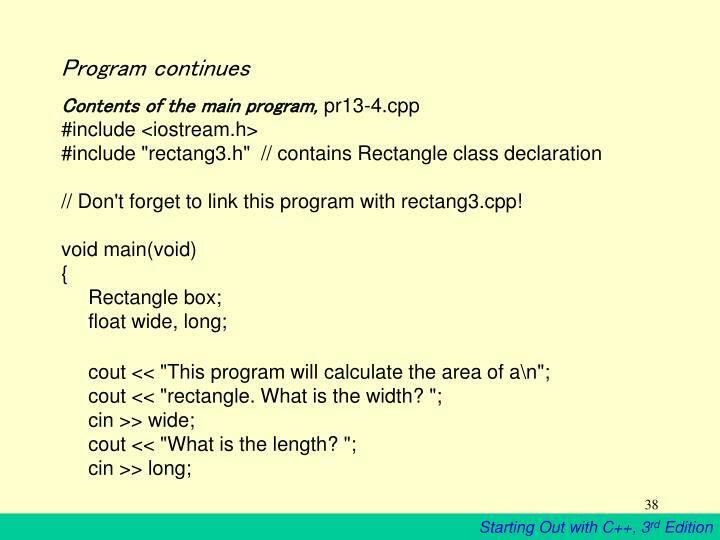 Notice that the Rectangle example has no cin or cout. 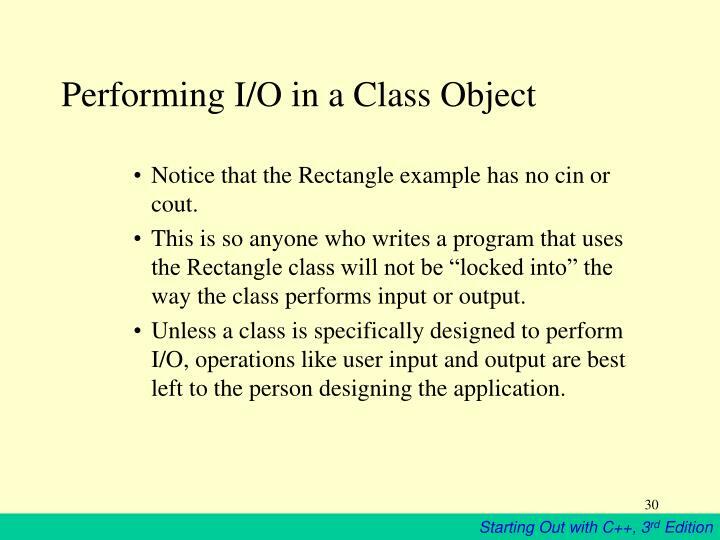 This is so anyone who writes a program that uses the Rectangle class will not be “locked into” the way the class performs input or output. 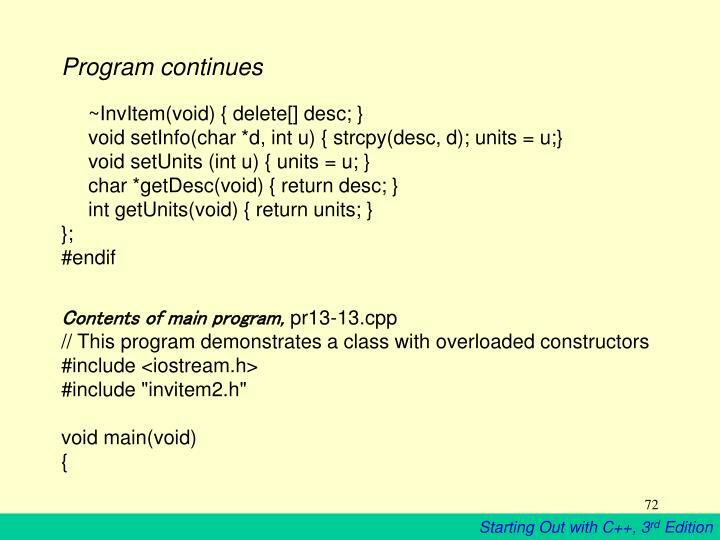 Unless a class is specifically designed to perform I/O, operations like user input and output are best left to the person designing the application. 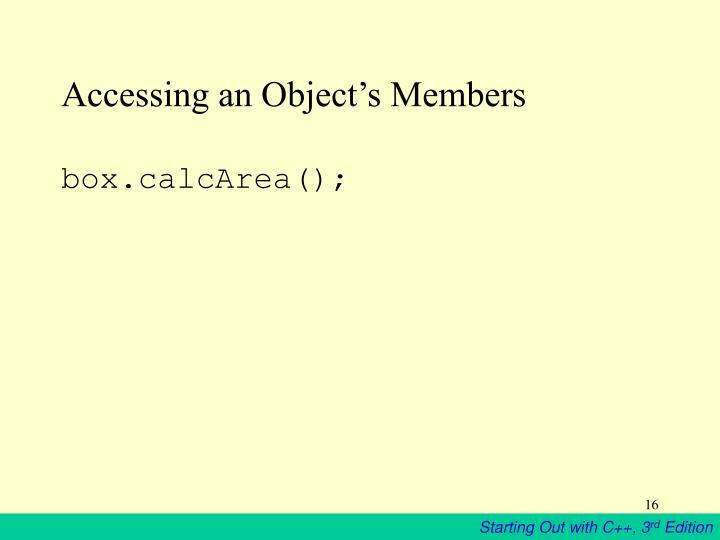 A private member function may only be called from a function that is a member of the same object. 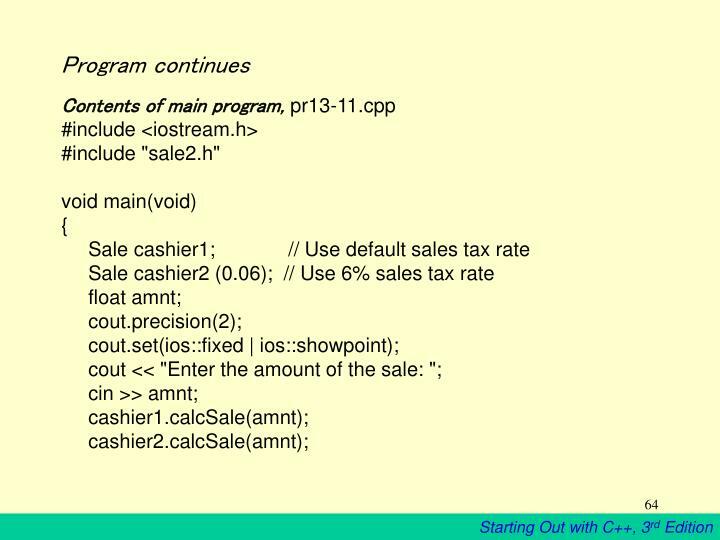 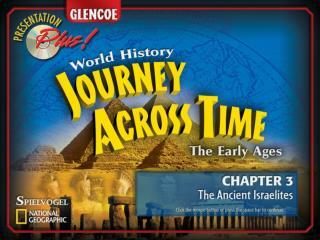 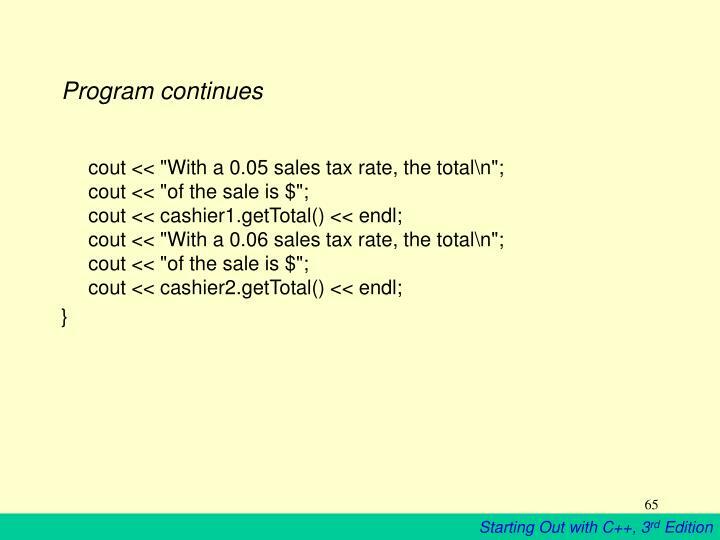 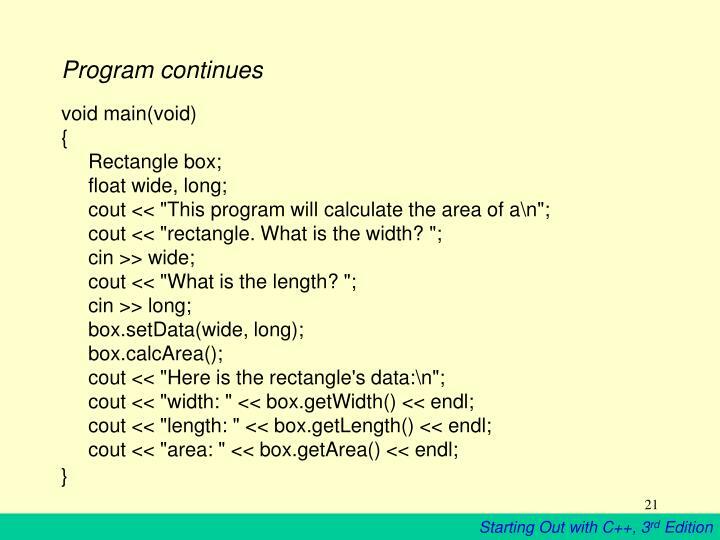 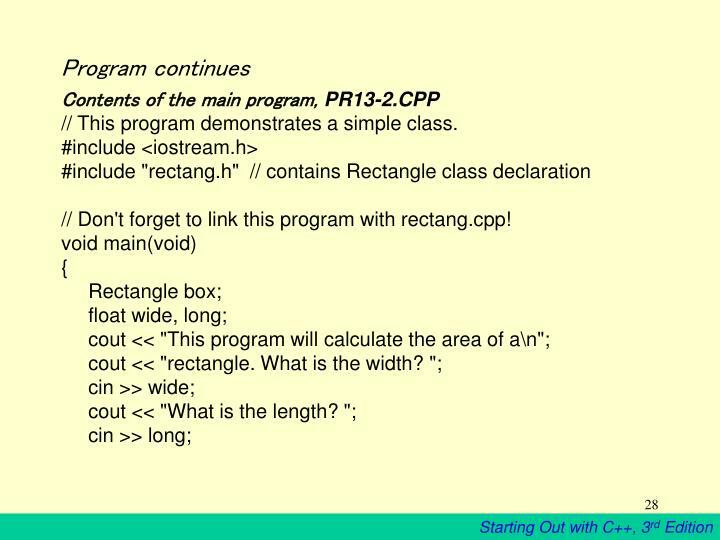 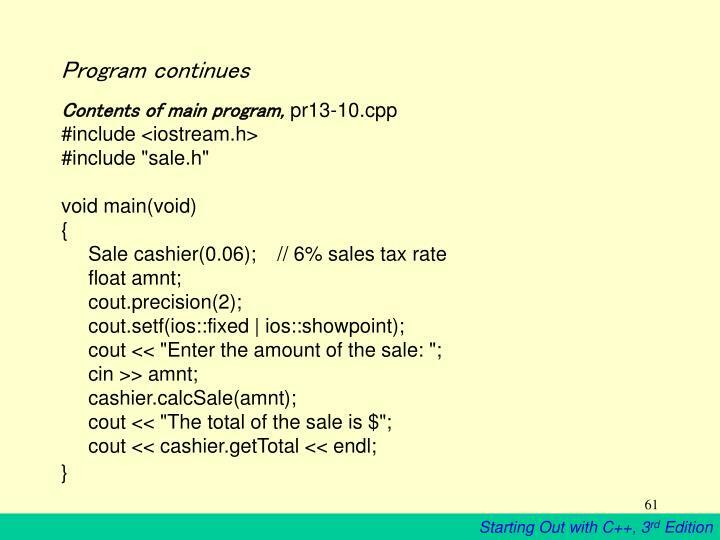 // Don't forget to link this program with rectang2.cpp! 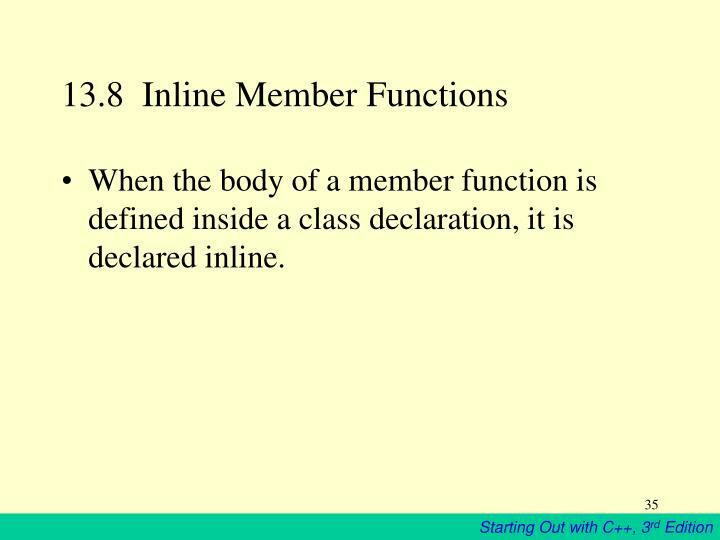 When the body of a member function is defined inside a class declaration, it is declared inline. 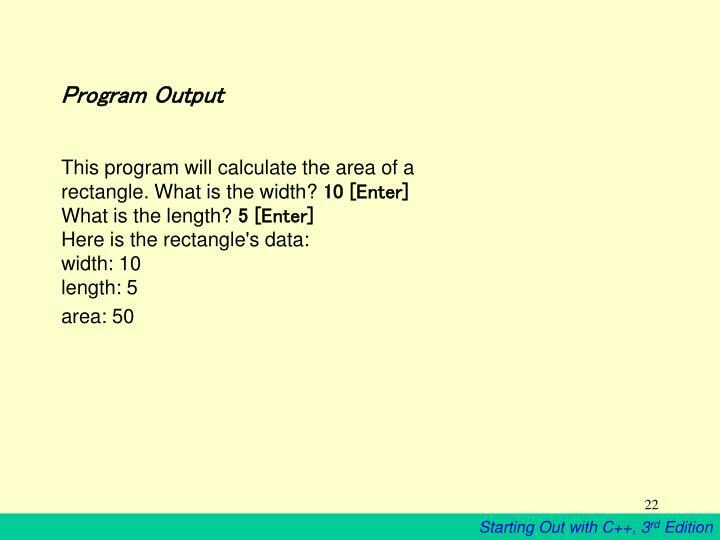 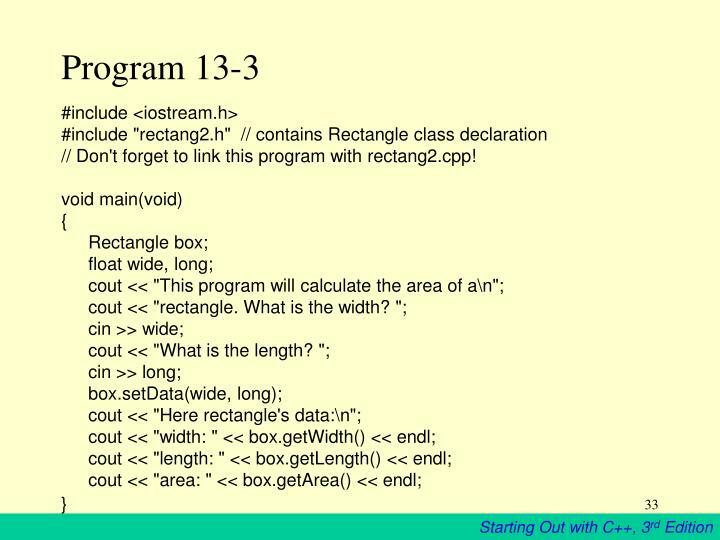 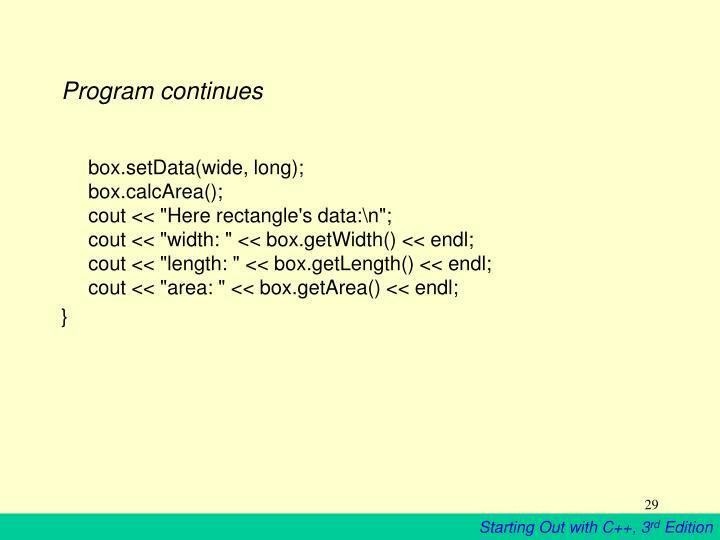 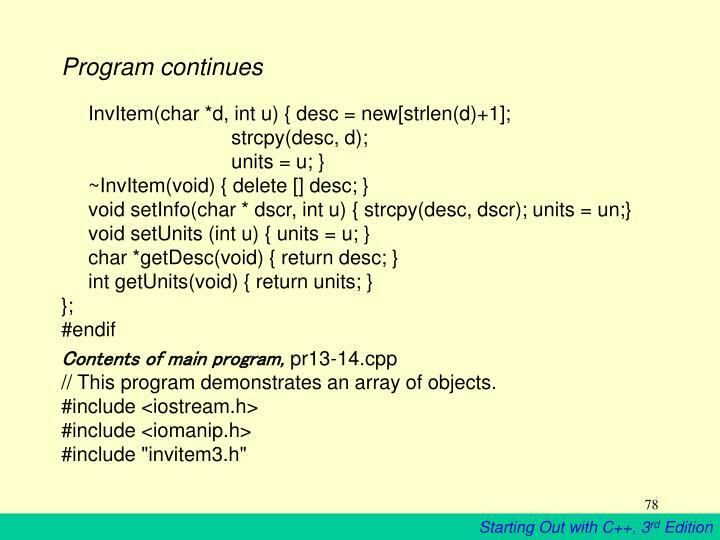 // Don't forget to link this program with rectang3.cpp! 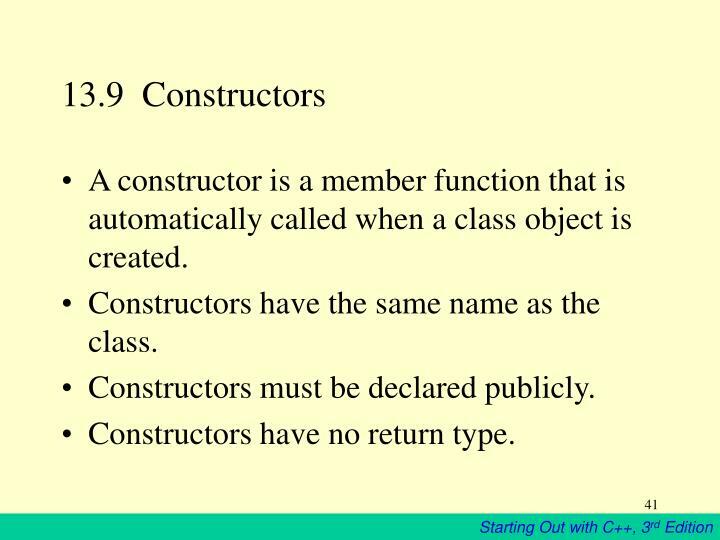 A constructor is a member function that is automatically called when a class object is created. 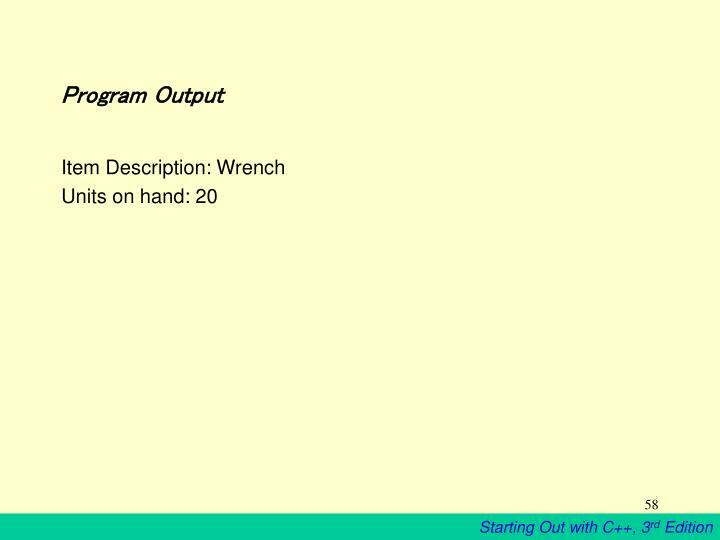 Constructors have the same name as the class. 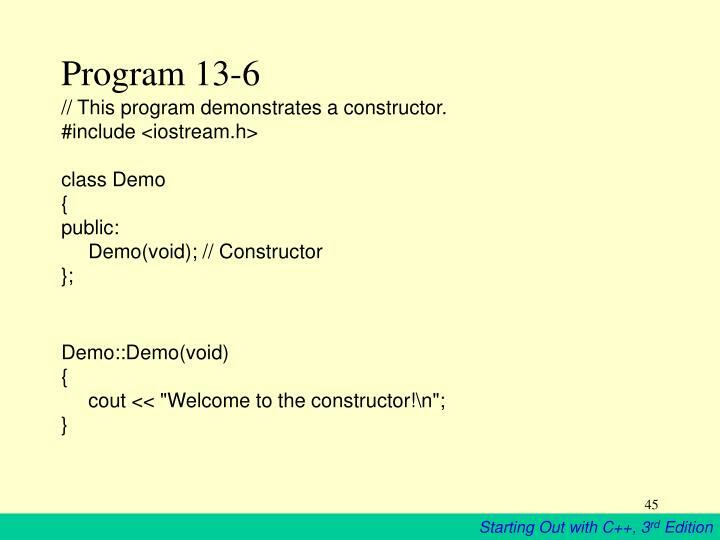 Constructors must be declared publicly. 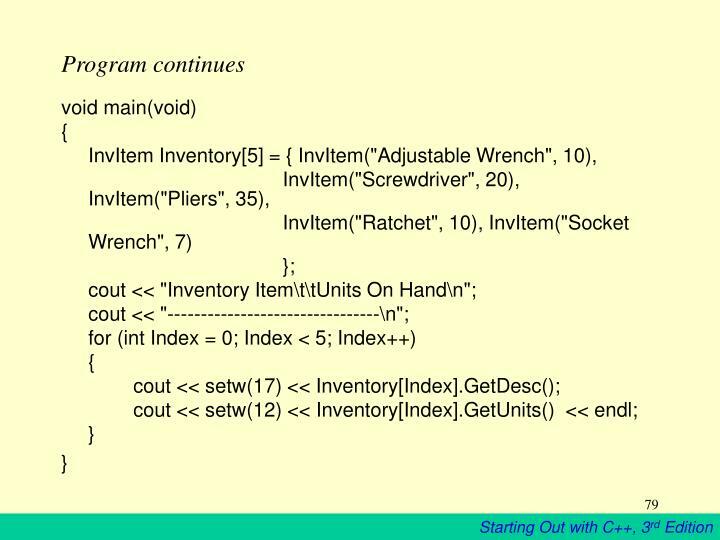 Constructors have no return type. 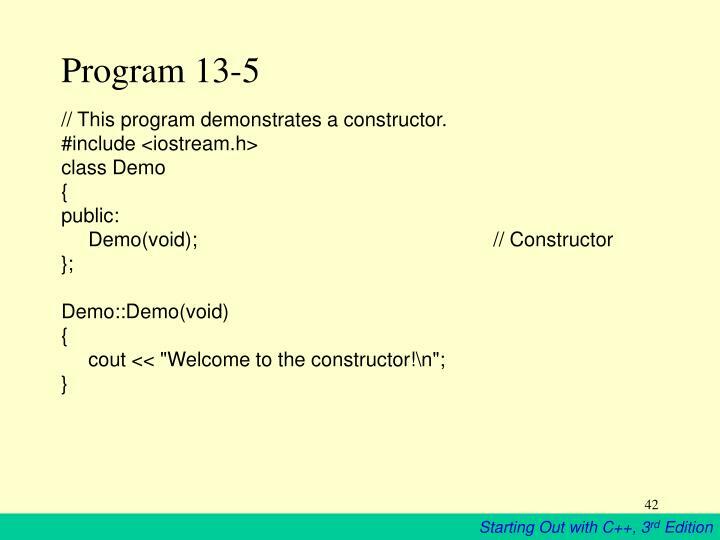 // This program demonstrates a constructor. 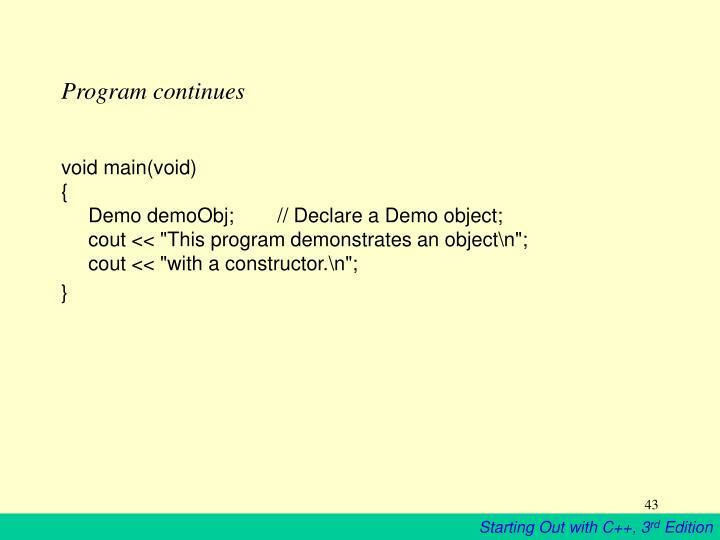 When a constructor does not have to accept arguments, it is called an object’s defaultconstructor. 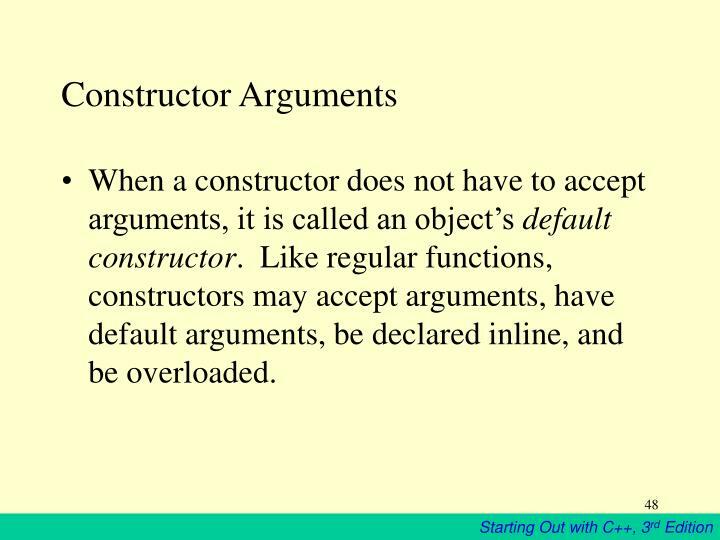 Like regular functions, constructors may accept arguments, have default arguments, be declared inline, and be overloaded. 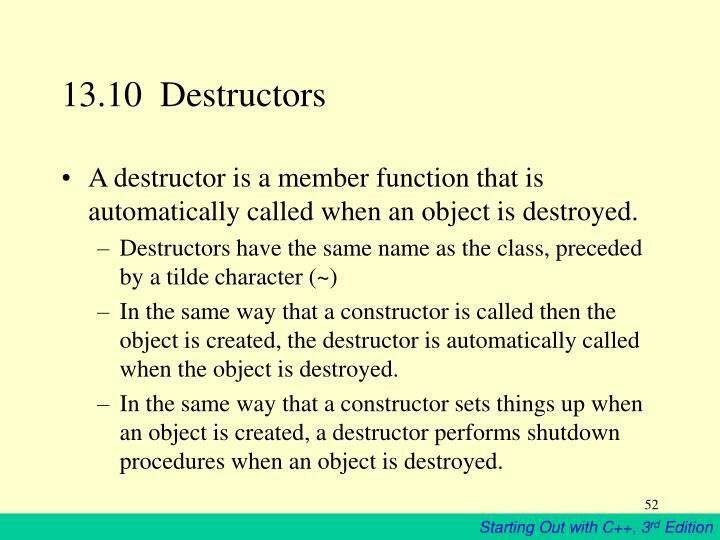 A destructor is a member function that is automatically called when an object is destroyed. 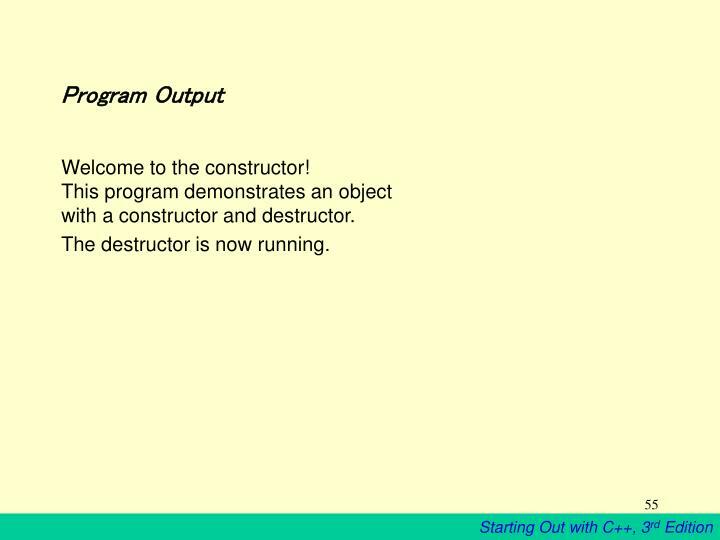 In the same way that a constructor is called then the object is created, the destructor is automatically called when the object is destroyed. 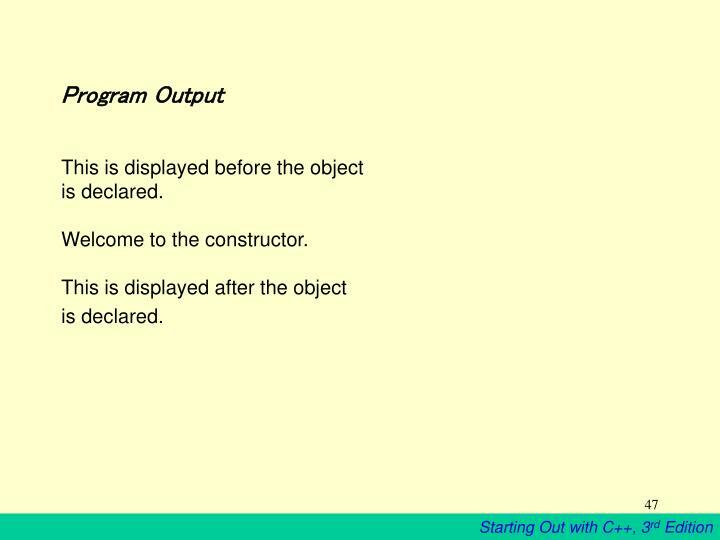 In the same way that a constructor sets things up when an object is created, a destructor performs shutdown procedures when an object is destroyed. 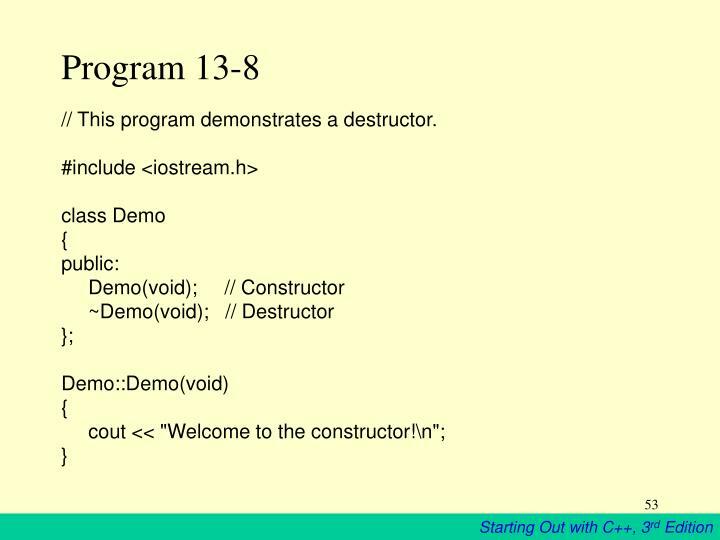 // This program demonstrates a destructor. 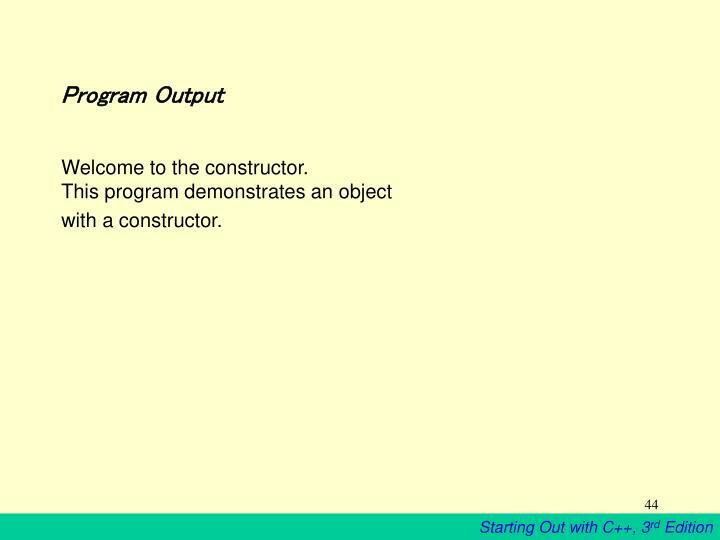 with a constructor and destructor. 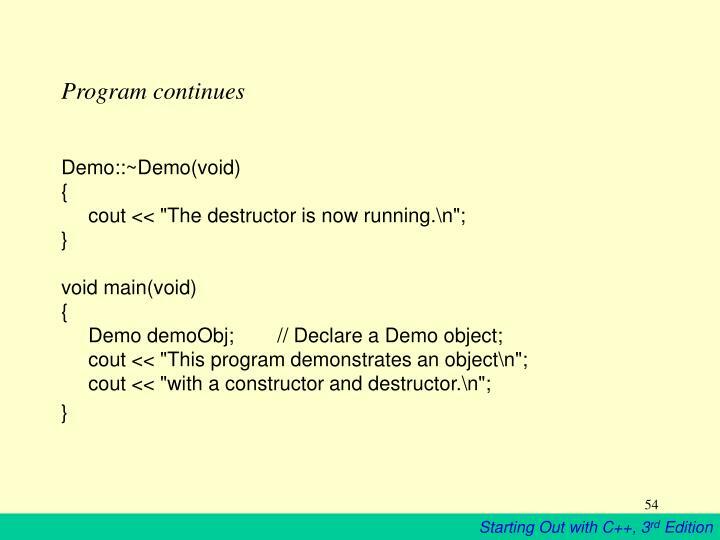 The destructor is now running. 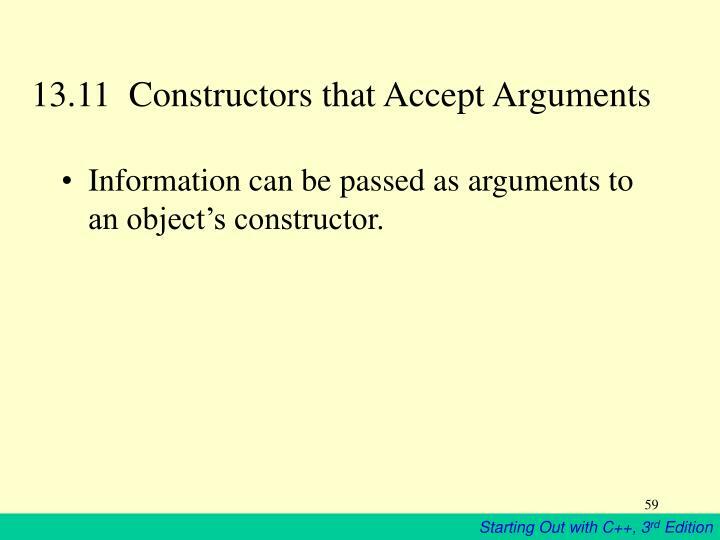 Information can be passed as arguments to an object’s constructor. 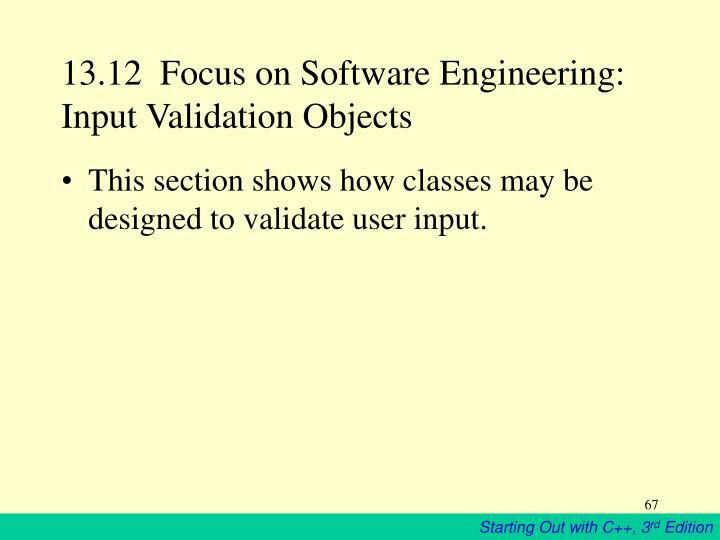 This section shows how classes may be designed to validate user input. 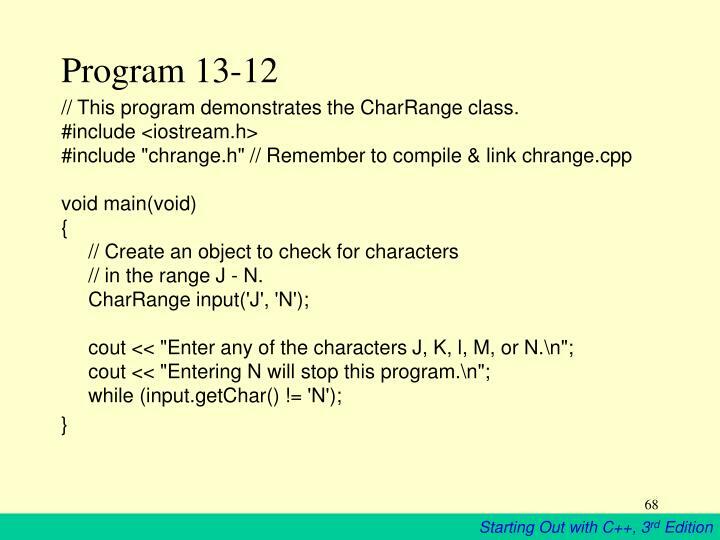 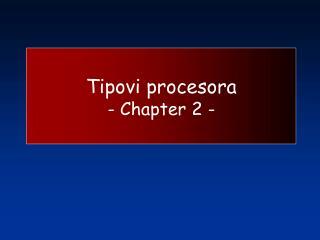 // This program demonstrates the CharRange class. 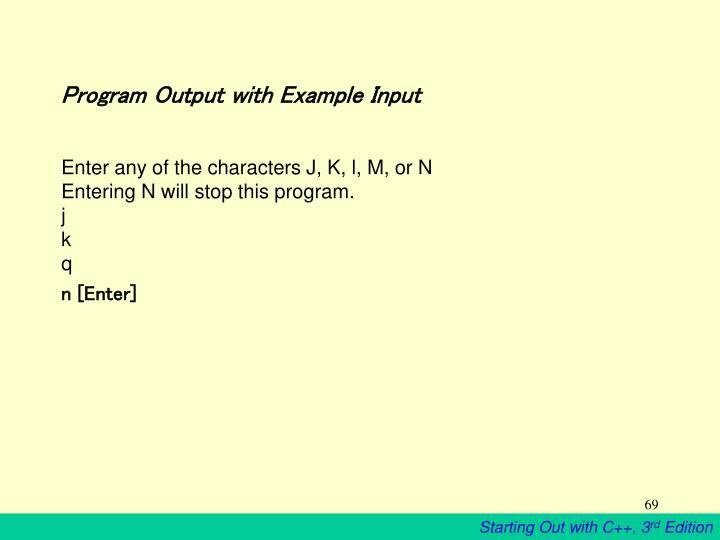 // in the range J - N.
Entering N will stop this program. 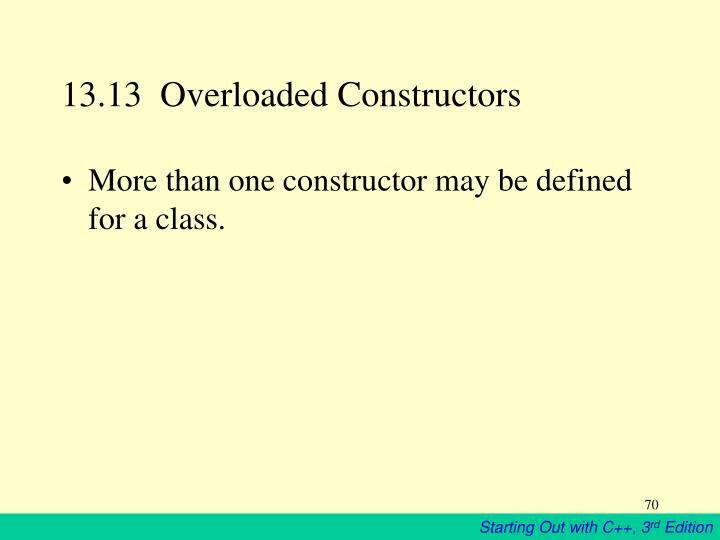 More than one constructor may be defined for a class. 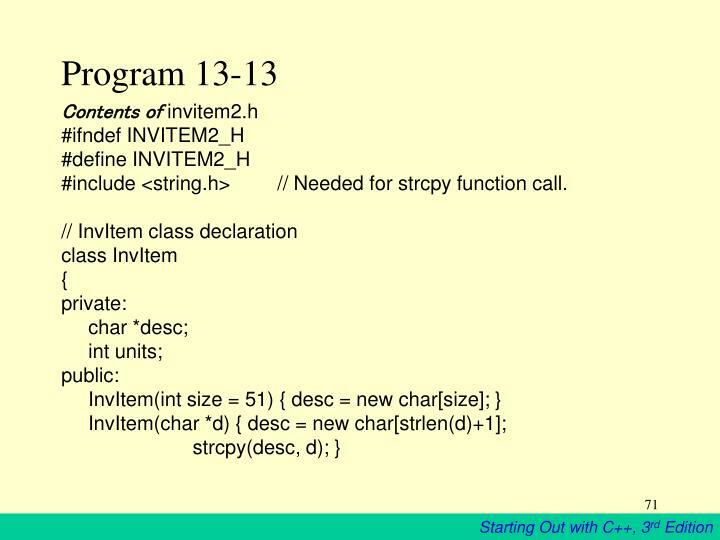 #include <string.h>	// Needed for strcpy function call. 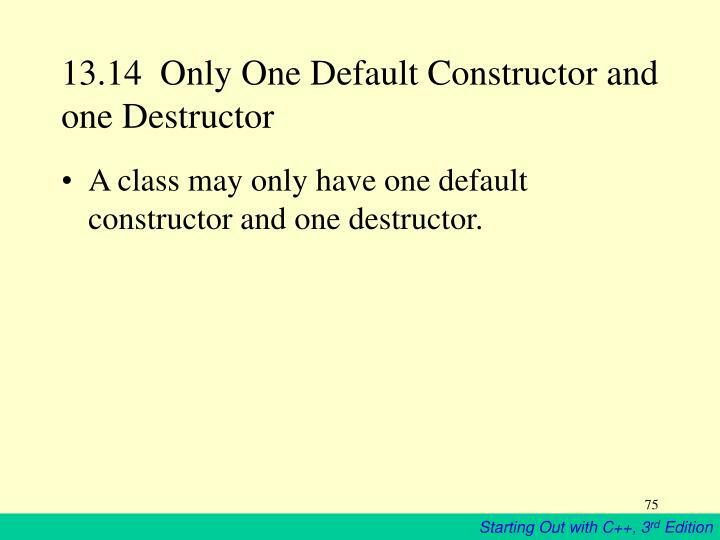 A class may only have one default constructor and one destructor. 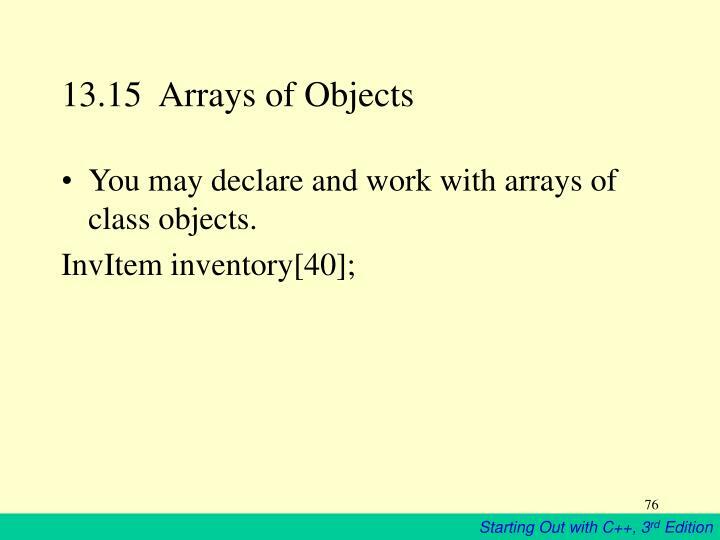 You may declare and work with arrays of class objects. 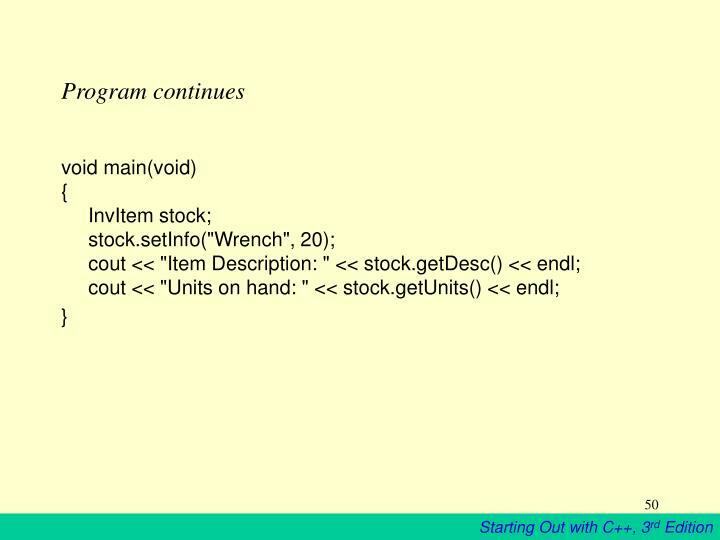 // This program demonstrates an array of objects.